WHERE: Communities throughout the state. WHO: The US Postal Service, the National Association of Letter Carriers and the American people. WHAT: Saturday, May 14th marks the 24th anniversary of America’s largest-single day of food donations — the National Association of Letter Carriers Stamp Out Hunger Food Drive. The Food Drive provides food to local community banks during a much needed time in a cooperative effort with the U.S. Postal Service and other regional partners. Just leave a non-perishable food donation in a bag by the mailbox on Saturday, May 14th, and your letter carrier will do the rest. It’s that simple and millions of Americans, including local residents may benefit. 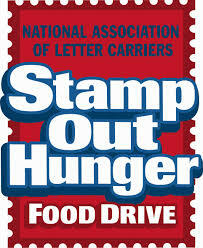 Last year, on this one day over 71 million pounds of food was collected nationally. Over the course of its 23 year history the drive has collected well over one billion pounds of food, thanks to the Postal Service’s universal network that spans the entire nation, including Puerto Rico, Guam and the U.S. Virgin Islands. The need is great. Currently 49 million Americans (1 in 6) are unsure where their next meal is coming from. Nearly 16 million children feel the impact of hunger on their overall health and ability to perform in school and 5 million seniors over age 60 have to decide between daily meals or paying for rent or needed medications. Why is this effort so successful? Letters carriers know their communities and recognize that need, even in unlikely settings. The coming months are especially trying for our neediest neighbors and for the local charities that serve them. In summer, other food collections taper off and as schools shut down, school breakfast and lunch programs also cut back significantly. The need escalates just as pantry shelves grow light. Food collected in a community stays in that community. We believe that is one reason for the success of this endeavor, because our customers know we are delivering right at home where the need is great. Many pantries also work with special dietary or family needs, such as feeding small children and infants, elder nutrition and ethnic needs. Donations of low to no-sodium, nutritional drinks and packaged ethnic specialties are welcome. I have some jars of sauce. Can I set these out? Glass containers pose a serious risk to our carriers and to pantry volunteers if broken in transit. In addition, spills can contaminate other donations. So please … no glass.